German police have arrested a man in Munich after four people were lightly injured by a knife attacker. 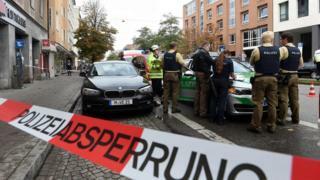 Police said the suspect lashed out at five men and one woman around Rosenheimer Platz in the east of the city, but missed two of his targets. A police spokeswoman said the detained man strongly resembled descriptions given by witnesses at the scene. The suspect is said to have started attacking passers-by shortly after 06:00 local time (04:00 GMT). "We have arrested a person who very strongly resembles the description by witnesses, but we cannot confirm that he is the attacker," Munich police spokesman Marcus da Gloria Martins said. Martins added that police had not been able to establish any motive for the attack. None of the victims suffered life-threatening injuries. Witness accounts described the suspect as a man in his 40s, unshaven, with grey trousers and a green tracksuit top and carrying a backpack and sleeping mat. Police said he fled the scene on a bicycle.